1953 Philco AM radio (also has the Marine/Police band but not much on that these days), five tubes. Iconic 1950's styling. 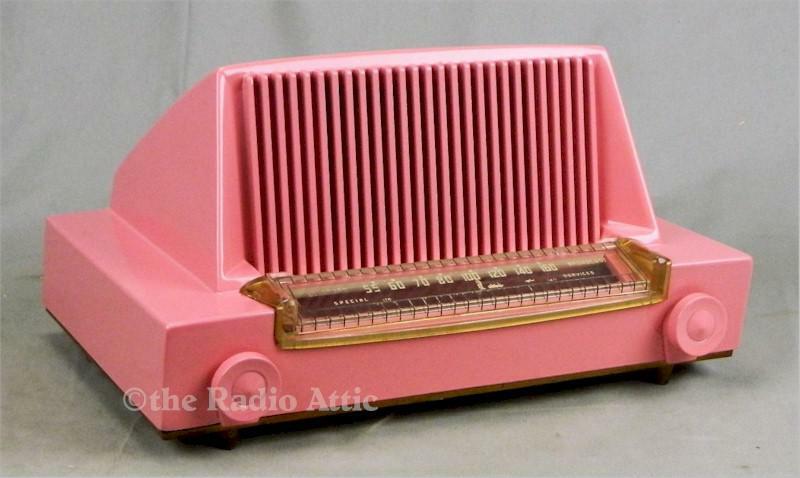 Case is without cracks or chips and looks fantastic with a new professional pink finish; oddly these iconic styled mid-century radios didn't come in any colors, only the brown plastic or the white painted that over the decades suffered many chips and marks. Receives stations along the dial. Just one of those radios with styling that captures the era perfectly. All components have been checked and replaced where bad or failing. Shipping is $25 within the continental United States. Will be expertly packed and sent fully insured. 14"W x 7-1/2"H x 10"D.